Hi all cardmakers & stampers! Today is World Cardmaking Day! I am here with some x-mas tags and a matching card. Unfortunately I will not be making cards today - so these are made a while ago. I really like the combination of pool, red and kraft for holiday cards. The tag is a silhouette die cut. Paper: Bazzill kraft, hero arts pool notecard, Basic Grey Nordic Holiday. Leave a comment on this post for a chance to win this sweet sweet set! Deadline: 10.10.2011. HAVE A GREAT WORLD CARD MAKING DAY! Hi Pia! Happy WCMD! I love this gorgeous color combo, thanks for the inspiration! I am playing with unconventional colors for Christmas this year, it's such fun! And thank you for a chance to win this gorgeous stamp set! Hi Pia, Happy World Card Making Day, Like you I was unable to make cards today as I was visiting my DD. Love your tags, you are right Kraft and red go so well together. Thanks for the chance to win the HA set. Hi Pia- happy WCMD to you! 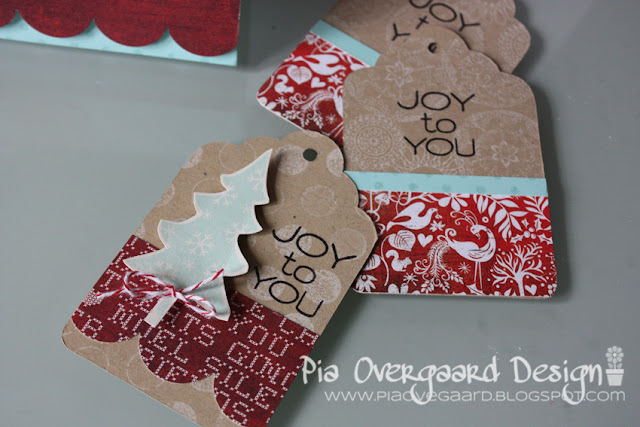 I really love the color combo of these tags and card you created- so pretty! Thanks for the chance to win such a generous prize. Happy World Card Making Day,Pia! Hi Pia your tags and card are really Great, i love it!, Congrats and Happy WCMD! Flotte tags og kort... og rigtig dejlig give away... den måtte da gerne komme denne vej forbi... go søndag..
Tak for en lækker give away og tak for en fantastisk convention. Kære Pia - TAK for i går - jeg så dig afholde SÅ mange kurser at du helt sikkert har været medvirkende årsag til at RIGTIG mange lækre kort blev lavet og vil blive lavet fremover - så det er da helt OK.
Ej nogle smukke juletags og kort. Farverne er rigtig flotte sammen og som altid godt hjulpet på vej af din kreative hånd. Tak for inspiratione til at komme igang med julerier. Herlige kort og tags, Pia! Denne fargekombinasjonen er jo uslåelig! I love the happy Christmas colors you picked for the tags. You can't help but smile! Hvor er det bare nogle lækre tags i en flot farvesammensætning! Flot farvecombination/ design på tagsene. Er især vild med det der er stemplet med hvidt - super ide. TFS. Tak for sidst. Altid hyggeligt at møde dig og dit mandskab på messe. Jeg kan bruge meget tid på at beundre jeres kreationer i virkeligheden. Happy WCMD weekend! Love your gorgeous tags and card! That is such a great color combo! Love the subtle stamping on the kraft, Pia! Beautiful - would love to have this new set to play with! love your color combination on the tags and card - will have to try that. thanks for a chance to win that gorgeous stamp set. Gorgeous tags and card Pia! Thanks for a chance to win that awesome stamp set! Love this colour combo with the bold red and soft pool, gorgeous! Hello, Pia! Your cards are always beautifully mastered. Your flicker photo stream is an example of what I would like to learn with time. The holiday card is cute. Thank you for a chance to win! Maria (Zayasa). Love your card! Thanks for the chance to win a great stamp set! Gorgeous card and colors, Pia! Your tags are so inspiring! I have been wanting to follow your blog,but have neglected to do so. I love your work, Pia and thanks for the chance to win this set! Wow, beautiful tags! Love the designs and colors you chose. Thanks for the chance to win. Beautiful tags, love the color combo!! and thanks for the chance to win, its very generous of you. Meget smukke kort og tags - jeg liker din "nordiske" touch. Love them. Thanks for à change to win this set. Beautiful tags and card, love the color combo. Thanks for the change to win that gorgeous stamp set! Pia,wonderful you to do this, that stamp set is gorgeous, thanks for the chance, it would be so loved!! Your tags are so cute, very original color combo, very festive and a nice break from the normal colors. Don't why I never seem to think outside the box color wise.Fantastic work as usual. Hi Pia: I didn't catch this post on WCMD, so a belated Happy WCMD to you. Your card is beautiful. And thanks for the chance to win this lovely stamp set. Happy WCMD! Gorgeous tags and card! So generous of you, I would love the chance to win. Love your card! You are always inspiring. thanks for the chance to win. Wow Pia....I love that color combination TOO and your tags are CAS....so classy!!! Thanks so much for the chance to win! Please know that this stamp set would be welcomed w/open arms in my house..TeeHee! Pia your cards I have noticed seem to always use Kraft paper/cardstock and the results are always outstanding. I look at your creations and wonder why I couldn't come up with something like that! Lol. I so love the flair you have for making cards with warm earthtones and kraft. The tags today are no exception. I can't believe how beautiful your cards are that you share over at Lily Pad. Your one talented gal that is for sure. Thanks for inspiring today and for the give-away. I thought that I was a follower of your work, like I am with so many others in our HA Flicker group but see here that I am not. So I will fix that right fast this minute. Thanks again sweetie for all that you share. Hugs. What a lovely set of tags and card :) thanks for the chance to win some Hero Arts stamps! the red with the kraft with the touch of blue is so pretty! great tags and cards here pia! Would love to join in your most generous offer Pia - always enjoy your artwork! Love your tags and card. Great colours. Thanks for the chance to win some Hero Arts stamps. Great colorcombo! Have to try this too! Love your tags. I always like your style! Great inspiration. Thanks. Wonderful design on both the card and matching tags! Beautiful colors and how sweet of you to give away the HA set! Hei Pia! Dette er et SUPERT prosjekt! Fantastisk flotte fargekombinasjoner - de er liksom "helt Pia" ! Veldig inspirerende å se at du også bruker stempler som ikke er typisk jule-stempler og likevel får frem julestemingen. So sweet to give away such a cool set. Love your tags, that color combo is fab, especially for the holidays! Gorgeous tags Pia - thanks for the chance to win beautiful goodies. Pia, I LOVE the color combo...so unique, but perfect for the holidays! Thanks for a chance to win that lovely set. Love your colour combination - I'm going to try some too. And thanks for the chance to win that HA set. Gorgeous tags and card, Pia! Love the colours and mix of pps! The soft stamping of the snowflakes looks great too! Thanks for the chance to win this gorgeous stamp set! Those are pretty colors together. I love the different patterns you used together. And I love that stamp set. Thanks for a generous giveaway. Love your cards and tags!!! Thanks for the generous giveaway~! I'd love a chance to win!!! Your tags are wonderful!!! That color combination is great!!! Hi Pia! Your cards are always some serious eye candy! Thanks for a chance to win this beautiful set!